WIN A TICKET TO DIAMOND BANK "ABUJA PICNIC"
Win a ticket to the ‘Abuja Picnic’ which comes up on November 29, 2015 at Julius Berger Shooting Range, Abuja by 12noon. For our fans in Abuja who would love to attend,Answer the Trivia Below and stand a chance to win free ticket for the picnic. 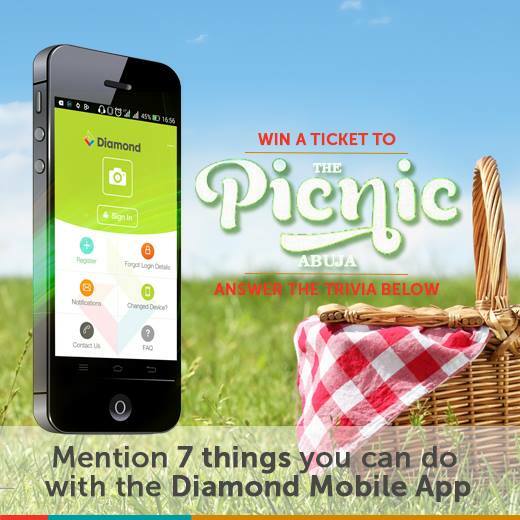 Mention 7 Things you can do with the diamond mobile app. There will be loads of fun activities at the venue.